In 1976, Osborne Industries, Inc., originated and initiated the closed-mold molding process that was later known in the plastics industry as resin transfer molding, or RTM. The resin transfer molding process has been in use ever since. RTM is one of the best methods for mass production of composite parts. It is primarily used to mold components with large surface areas, complex shapes and smooth finishes. The automotive, industrial equipment and agriculture industries have used the resin transfer molding process for decades for these reasons. Below we discuss a more detailed step-by-step of the resin transfer molding process and its advantages. The preform, or contoured fiberglass reinforcement, is the matrix, already in the shape of the finished product, into which the resin will be injected. First, the type of fiber must be defined. There are several different fiber types available for use in RTM composites, from random mats to two-dimensional woven rovings. Once the preform or fiberglass reinforcement is created, it is packed into a mold cavity that has the shape of the desired part. The mold cavity is then closed and clamped. The mold cavity allows for precise control over part thickness and allows for a smooth finish on both the A and B sides of the part. Gel coats may be used inside the mold to provide a high-quality, durable finish. Catalyzed, low-viscosity resin is then pumped into the heated mold under pressure, displacing the air through vents , until the mold is filled. The injection phase must guarantee the complete impregnation of the preform. Bad impregnation of the fibers results in dry spot areas with missing adhesion between the layers. After the injection phase, the curing cycle starts, and the resin polymerizes to become rigid plastic. Curing time varies and is dependent on the mold temperature and chemistry of the resin being used. 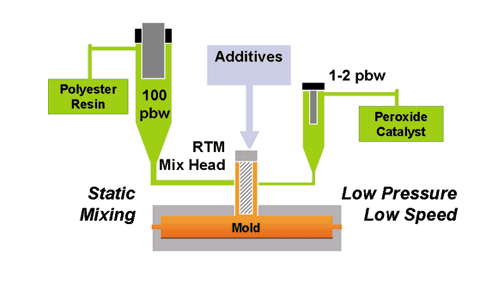 Resin transfer molding continues to be an increasingly popular method of fabrication. Contact Osborne Industries today for further information on how we can assist in your next molding project.